It's September and that means it's Childhood Cancer Awareness Month. For the third year, our family is embarking on the Fluttering journey. Each night in September, we go to a house and put 12 dragonflies and a sign on the lawn as a fundraiser for Unravel Pediatric Cancer. My kids thoroughly enjoy Fluttering! It's a fun and beautiful way to raise money for a very worthy cause. It also allows me to teach my kids how to give back and have empathy for others even if we are not in that situation. We fundraise because Childhood Cancer is severely underfunded. ALL childhood cancers (brain, blood, etc...) combined receive less that 4% of the government allotted funding for cancer. Relay for Life only gives $.01 of every dollar earned to pediatric cancer. Pediatric Cancer is the #1 disease killer of children in the US. I have too many friends who have children who have cancer. I know too many people whose lives have been touched by cancer. We NEED to find some sort of cure. There are scientists and doctors with ideas that just lack funding. It breaks my heart. 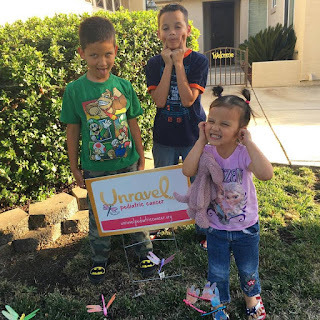 If you'd like to donate, please do so at : http://give.unravelcancer.org/newellfamily. If you are local to us (Sacramento, CA area), please check out our SUPER FUN Fluttering the Community 3 Event!